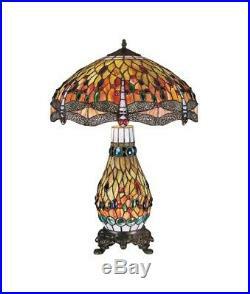 Tiffany Style Large Dragonfly Stained Glass Dual Table Lamp. This large dual lamp is a true Tiffany inspired classic featuring the dragonfly design. Blended blues and greens with red amber and yellow jewels adding splashes of colour. The illuminated matching glass base adds to the overall stunning effect. Shade Colour: Blue, Green, Red, Amber, Yellow. Width / Diameter: 18 / 46cm. Height: 27.5 / 70cm. LIGHT OUTPUT AND BULB INFORMATION. Number of Lamps: 3 (not included). Suitable Bulb: Any Shape - ES (E27) x 2, Candle Shape - SES (E14) x 1. Maximum Bulb Wattage: Any Shape - 60 Watt or 11 Watt low energy equivalent, Candle Shape - 25 Watt. Suitable for low energy or LED bulbs. Suitable for most rooms including the bedroom and living room. We also deliver to Germany, Italy, Ireland, France and Spain (additional costs apply). The item "Tiffany Style Large Dragonfly Stained Glass Dual Table Lamp (Height 70CM)" is in sale since Monday, November 26, 2018. This item is in the category "Home, Furniture & DIY\Lighting\Lamps". The seller is "lighting_supermarket" and is located in Barrowford. This item can be shipped to United Kingdom, Ireland, Germany, France, Greece, Italy, Spain, Austria, Belgium, Bulgaria, Croatia, Cyprus, Czech republic, Denmark, Estonia, Finland, Hungary, Latvia, Lithuania, Luxembourg, Malta, Netherlands, Poland, Portugal, Romania, Slovakia, Slovenia, Sweden, Australia, United States, Canada, Brazil, Japan, New Zealand, China, Israel, Hong Kong, Norway, Indonesia, Malaysia, Mexico, Singapore, South Korea, Switzerland, Taiwan, Thailand, Chile.